Wholesale Sign Supply Company Carries 100s of In Stock Merchandise! 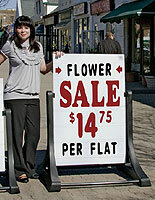 This Sign Supply is a Unique Sidewalk Display that Gets Your Message Noticed! 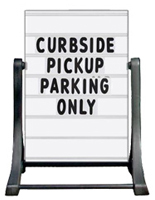 24" x 36" 29" x 45" 48" x 36"
This quality sign supply for sale features a rustproof techno-polymer construction with internal steel supports for a long-lasting, secure signage system that is able to endure light rains. This sign supply, also known as a roadside adjustable letter board, has handles that make it easy to move from one place to another. Assembly of this sign supply takes less than three (3) minutes and requires the use of a simple screwdriver. 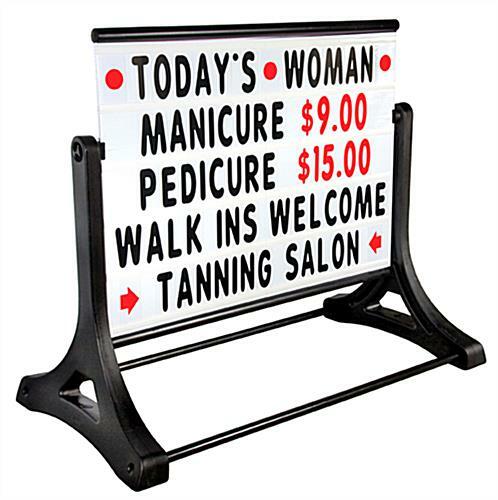 This sign supply is the perfect communication tools for retail establishments, salons, supermarkets, libraries, and many other venues. This sign supply is the ultimate in outside showcases! This sign supply is a big outside sign with plenty of space on which to exhibit messages. The double-sided exhibit provides 48" x 36" of display area and holds up to five lines of messaging! The letter board face comes with 1.5" diameter frame hangers at the top and bottom adding support as well as a decorative element. This outdoor, adjustable letter exhibit, sign supply may be changed as often as needed by simply sliding the letters into and out of the letter grooves. 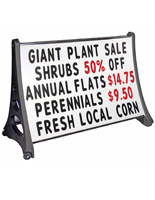 This sign supply, also recognized as a roadside board, comes with 421 - 5" letters, numbers and symbols. 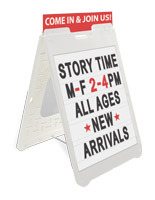 This double-sided signage, sign supply, is designed to fit through any 36" doorframe. The sign legs are designed to hold 10 to 15 lbs. of sand, making it able to remain standing in winds up to 30 MPH. 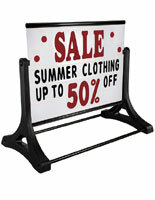 This big sign supply exhibits up to 5 lines of 5" letters, numbers or symbols on each side. Professional sign supplies for sale at wholesale prices! (1) 48" x 36" white sign face with tracks on both sides and frame rails for top and bottom. 60.0" x 48.0" x 30.0"